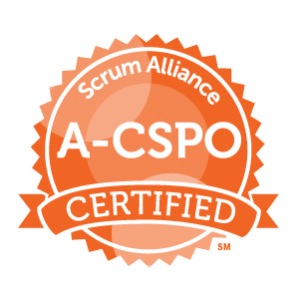 The Advanced Certified Scrum Product Owner™ (A-CSPO™) course is part of the Scrum Alliance’s Path to Certified Scrum Professional®. This step in the Product Owner’s journey is a combination of workshop, applied learning on the job and reflective learning as part of online group coaching sessions. This programme is aimed at practicing Product Owners, growing skills and knowledge in areas such as stakeholder identification and management, neuroscience-based collaboration techniques, scaling and advanced product backlog management. It focuses on growing a Product Owner’s knowledge and skills to define and operate in a more Agile product-based organisation driven by product outcomes and metrics, supported by results driven approaches and insights into human based biases and behaviours. The two-day workshop builds on a combination of interactive exercises, practical real-life examples, and lively discussion, and will equip you with the knowledge required to be an effective Scrum Product Owner. Real learning happens through application and reflection, so following the workshop you will have access to optional online coaching sessions, so that you can reflect on how you are applying your knowledge and skills. On completion of the 2 day workshop, you will become an A-CSPO™, which will make you eligible to work towards the Certified Scrum Professional®. This course is for Scrum Product Owner’s with at least a year’s experience in the role. You must have Agile experience as the course will build on your experiences in order to deepen your understanding of Agile and yourself. Following successful completion of this course, participants will be designated as Advanced Certified Scrum Product Owners. This Scrum Alliance certification includes a two-year membership in the Scrum Alliance.